The wild black raspberries were delicious and plentiful this year. They ripen before the wild blackberries, so look for the black raspberries in June. We ate them for about three weeks in June, from the 8th to the 24th. By the end of the month the black raspberries were getting pretty dried up. These black raspberry fruits were juicy and delicious. Photo taken 15 June 2010. Fruits of the two closely related berries are similar, but the raspberries have a hollow center while blackberries do not. The black raspberry is more desirable as it has fewer and smaller seeds than blackberries do. The taste is similar, but the blackberry might be a little more tangy. 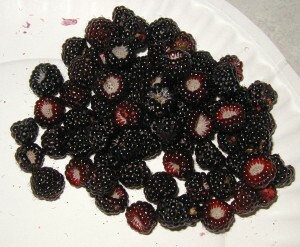 On 27 June 2010 I ate the first handful of large juicy wild blackberries for 2010. The particular cane that provided me with a snack had been mowed over so most of the berries on the cane were killed off early. The cane must have been able to put all its efforts into growing the few fruits that remained. Also, the ripe berries were right next to the ground, so they probably had a little help in the form of heat coming up from the gravel lane. Most of the canes hold their berries two or three feet off the ground. 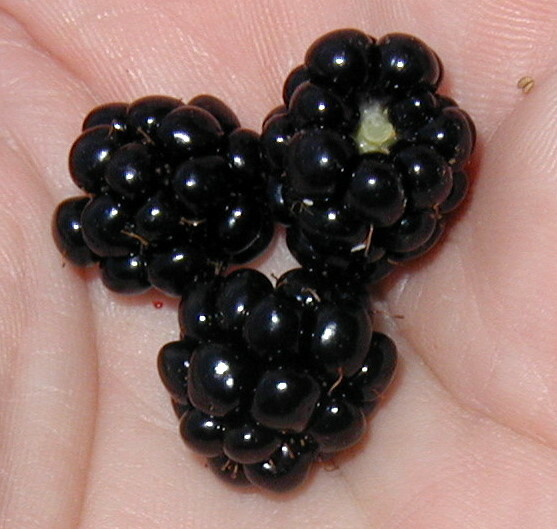 Blackberry fruits retain their stem so they don’t have a hollow center like raspberries do. Photo above taken 29 June 2010. Most blackberries don’t ripen much by the beginning of July. At first a few turn from bright green to green with a pale tinge of red. They turn a brighter red before darkening completely. The heat of July brings on the ripening of the blackberries in earnest. This year has turned out to be quite dry, so the berries may be drying up before they ripen. If we don’t get some rain soon, our plans for making blackberry jelly may have to change.